Clean tech specialists ABB and Ballard have come together to develop a large scale fuel cell solution for the shipping industry. Their system for hydrogen-powered ships aims to generate 3MW or 4,000 hp and fit within a single module no bigger than a conventional boat motor. ABB and Ballard aim for nothing less than the next generation of fuel cells for an industry that only recently has come aboard the electric powertrain. For their fuel cell power system, the partners will leverage their existing kilowatt-scale fuel cell technologies and optimise them to create a megawatt-scale solution suitable for powering larger ships. With the capacity to generate 3 MW (4,000 hp) in electricity, the pioneering system will fit within a single module no bigger in size than a traditional marine engine running on fossil fuels. Rob Campbell, Chief Commercial Officer at Ballard Power Systems says their “prior development and deployment of megawatt-scale containerized PEM fuel cell systems for land-based use” would give them the “experience and knowledge to collaborate effectively” to translate their solutions for the marine world. 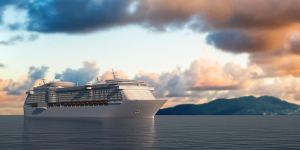 During the initial phase, the collaboration will focus on the development of fuel cell power systems for passenger vessels such as cruise liners or ferries. Fuel cell systems can have various applications for such vessels, like providing power for a ship’s hotel operations during docking, or for powering the propulsion when ships are at sea. “The next generation of ships – electric, digital and connected – will require energy sources that are not only able to meet the increasing demands for fuel efficiency, but will also enable cleaner and safer shipping,” knows Peter Terwiesch, president ABB’s Industrial Automation division. Recent regulation by the IMO indeed has called for the electrification of the shipping industry for the first time in its history reportedly. Moreover, ABB is involved in various projects such as building a hybrid icebreaker for example. So far, ABB and Ballard have signed a MoU for their joint marine fuel cell system. They have yet to disclose a schedule for trials or production.